Sometime we need to have a numerical way to measure productivity, for instance, it is useful to have productivity overview for the company, to answer the question how good does your employees work. If they help you to earn money or wasting your time. Do your people work efficiently? Do they solve problems and assign goals in a right way? It seems that it is impossible answer all these questions, but actually, there are some tools that might help you. Productivity Balanced Scorecard by AKS-Labs was designed to help business owners and other people to evaluate their productivity, to connect productivity value with key business goals. 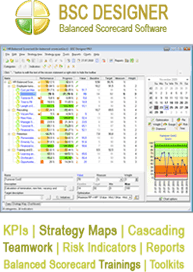 Right now you can download and try the evaluation version of the balanced scorecard designed in Excel file. If you purchase the scorecard it will be delivered as Excel file and file in .bsc format (which is editable with Balanced Scorecard Designer). What is Productivity Balanced Scorecard? It is a set of metrics (key performance indicators) grouped into 4 categories: Financial impact of Productivity, Productivity in Internal Process, Productivity and Customers, Better education and Growth. Each category includes its own indicators (metrics), which will help to measure the productivity. For instance, indicator “Time Saved” within the “Financial impact of Productivity” category, suggest to evaluate “Additional time spent/saved in hours per employee per week, as a result of high/low work productivity”. Indicator “Customer Support Efficiency” in “Productivity and Customers” category suggest to analyze “Average time spent answering emails, phone calls, or complaint/comment letters”.